Donald Trump was cut off and chastised by a pastor in Flint, Mich., as he addressed her congregation on Wednesday. Trump was criticizing his opponent Hillary Clinton's when Rev. Faith Green Timmons abruptly interrupted. She said: "Mr. Trump, I invited you here to thank us for what we've done in Flint, not give a political speech." Trump replied, "Ok, that's good," and resumed speaking about Flint. 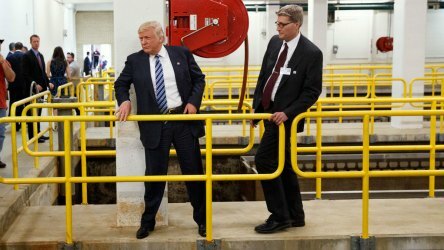 Earlier Wednesday, Trump toured a water treatment plant that has not been operational since last fall. Flint's water supply was found to be contaminated with lead, which has affected an estimated 100,000 residents since 2014. Flint Mayor Karen Weaver, a Democrat, said the Trump campaign has not offered any help and did not consult her before making plans to visit Wednesday. Weaver said in a statement that "Flint is focused on fixing the problems caused by lead contamination of our drinking water, not photo ops." She said she would be in Washington during Trump's visit. Residents of Flint held a press conference Wednesday morning accusing Trump of using the city as a "prop" for his campaign. "Where the hell have you been?" asked Ron Bieber, president of the American Federation of Labor and Congress of Industrial Organizations in Michigan. He said Trump "hasn't lifted a finger" to help the people of Flint and that if he cared, he'd write a check during his visit Wednesday for $10 million to deal with the crisis. Bieber said Hillary Clinton, who visited the city in February, "was the first presidential candidate to speak up about the Flint water crisis. She’s the reason we had a presidential debate in Flint." The Michigan Republican Party said at the time that Clinton was exploiting the crisis in Flint for political gain. “Families and residents in Flint deserve better than being used as political pawns by a presidential candidate," Michigan Republican Party chairwoman Ronna Romney McDaniel had said in a statement. "This visit is not an act of benevolence; it is a calculated campaign tactic — an attempt to grab headlines by a struggling campaign." In recent weeks, the Trump campaign has increased its outreach to African-American voters. The majority of Flint residents are black.